Mince pies and mulled wine will be served. Often voted the funniest film of all time, this classic is just right for these gender fluid times. 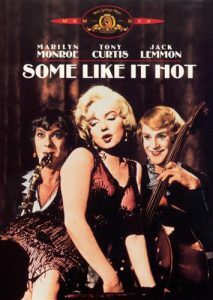 Made in 1959 and set in 1929, directed and produced by Billy Wilder, starring Marilyn Monroe, Tony Curtis and Jack Lemmon, the film is about two musicians who dress in drag in order to escape from mafia gangsters whom they witnessed commit a crime inspired by the Saint Valentine’s Day Massacre. It is not only a marvellous film but also incredibly tolerant and challenging for its time.